The winter circle is high overhead in the early evenings of March in the Philippines. It’s name draws questions because Philippine children do not know four seasons, so I have to explain to them how it got its name. This particular night was with my wife (a budding observer of the heavens) and one of our Philippine “daughters” by friendship. While I set up the little 80-mm refractor for the moon, we went through the Circle. Actually, my wife knew most of it as we ran from Sirius to Rigel to Aldebaran to Capella to Castor/Pollux to Procyon…and back to Sirius. The young girl smiled and gazed with her but so did a younger Filipino boy. He came to see the moon but wanted to catch the action, too, so he went through the little tutorial. The quarter moon was “inside” the Winter Circle. With a moon map handy and the kids and wife excited, we quickly ran over the lunar surface at low magnification while I selected a spot to sketch. I found a favorite trio, upped the magnification a little bit, and started an outline. The young girl was not impressed with a simple outline but listened as I explained the straight forward steps to observe and sketch a crater area. 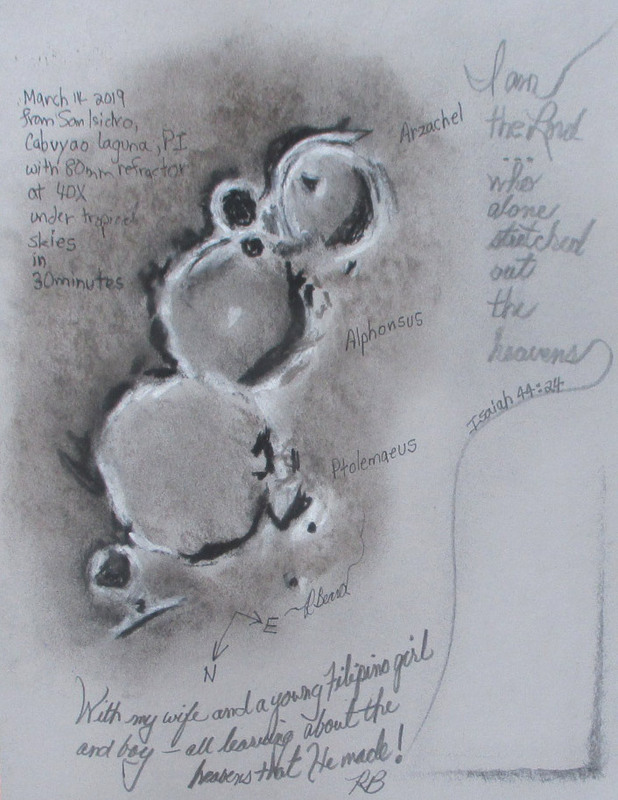 I explained as I drew: make a simple outline of the crater walls, highlight the black shadow areas, highlight the white areas exposed to the bright sun, understand where the light comes from, get the in-between greys, go for some detail and repeat the same process along with a little shading. I showed them how to start with a crater area, then work around it in a methodical fashion. A 30 minute drawing session is good, because it is short enough to see the development steps but long enough to render a reasonable sketch. As usual, the little observers came to believe that you could really see that much detail if you just went through the little process in a sketch. I added the observing sheet detail for the equipment, the crater identification, the verse of Scripture that gives the Creator credit for what I observe, and the comment. I smile as I explain, “If you do all these things and turn it in with a signature, I would give you an “A”. We almost always end up with more interest in the sketching process than actually looking through the telescope. Isn’t that interesting? The scriptures are clear: if we add things consistently to our little faith in Jesus Christ, if we add some of the knowledge of His Word as part of that, and we keep doing those faithful little things, our relationship with Him grows and bears fruit. Tagged children, creation, inspiration, moon, observation, Philippines, sketches. Always, always amazed by your art skill and knowledge of the heavens. I can pick out the big dipper 😊. Thank you. I am taking care of her. She is a gift.